The water supply picture for the Columbia Basin has continued to deteriorate going into the summer, with some new wrinkles. Most notably, areas like Montana that had streamflow forecasts close to average predicted have gone into below-average ranges. "Everything pretty much south of the Canadian border is looking pretty pathetic, actually," said Kevin Berghoff, senior hydrologist with the National Weather Service's Northwest River Forecast Center in Portland. Rivers and streams throughout the Columbia Basin, to varying degrees, are now flowing at levels normally seen in late summer. The Northwest River Forecast Center monitors flows at more than 320 sites in the Columbia Basin, and record-low streamflow forecasts are predicted for many of those sites through September. "Especially problematic this year is the temperature departures," Berghoff said. "We are seeing temperatures that are substantially above normal, up to six degrees higher than normal." That has been a driving factor going back to the early spring, creating a rapid and early runoff from mountain snowpacks, but hot and dry conditions have been persistent since then. According to a recent advisory from the National Weather Service, the impacts of high temperatures, the early loss of the snowpack, along with a lack of spring precipitation, "can be seen in the remarkably low flows in the region's streams and rivers, many of which are already at levels we would typically see in August. While flows are already very low for this time of year, streamflows can be seen to steadily decline throughout the summer." Long-range hydrologic models are forecasting "far below normal river flows and water supply for all unregulated rivers and lakes in the Inland Northwest through the summer," the advisory states. 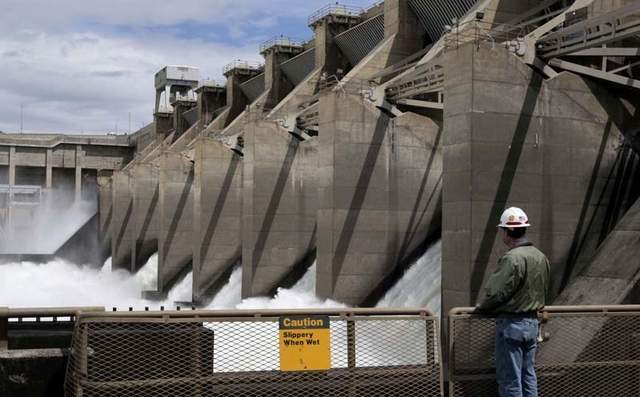 "Some rivers with large dams on them may see periods of above-average flow this summer as water is moved through the Columbia River system for power, irrigation, or ecological needs." "Our water supply forecast has been dropping at a steady rate since the beginning of the year and it is likely to continue to do so through the rest of this water year," Berghoff said. It was just a short couple of months ago when snowpack and streamflows in the Montana headwaters of the basin were regarded as a bright spot in the overall picture, but hot and dry weather changed that outlook quickly. Northwest Montana's Flathead Valley recently endured 33 straight days without any rain, a streak that was snapped on July 7 when the area got .26 inches of rain. The valley also had multiple straight days of 90-plus degree heat over the last month. The area's longest period without measurable precipitation was 52 days in 1907. Furthermore, a bulletin recently posted by the U.S. Army Corps of Engineers cites record-high evaporation rates for the period of April through June 24 since measurements for the region started to be recorded in 1980. In response to the hot and dry conditions, people are increasing their water use. One water district in Flathead County, for instance, reports that water use in June skyrocketed to 119 million gallons of water, when average June water use in the district has amounted to about 65 million gallons. "That really doesn't shock me at all with the lack of precipitation and as warm as it has been," Berghoff said. "This year, almost guaranteed, things like evaporation are going to be greater than what we've estimated in our model... . Water use, I could see that being higher than normal also."